When I discovered Content Runner in early 2014, I assumed it was just like all of the other sites where online copywriters go to find work. These sites usually offered low pay and strictly monitored all communication between clients and writers. Considering I had written for about a dozen of them over the past three years, my mistake was understandable. I wrote a few articles for Content Runner after registering and then abandoned it, as well as my online writing career altogether, for about nine months. A combination of fate and desperation brought me back to the site in late 2014. After being my own boss for so long, life as an office temp just wasn’t where I wanted to be. I began to understand the system here at Content Runner and use it to my advantage. For me, this started with building a strong profile. Because Content Runner doesn’t limit the sharing of personal information, I chose my real name as a user ID and listed links to work I had previously published on the web. Clients could see that I was a real writer, not just an anonymous person trying to earn a few extra dollars online. I also chose to link my Twitter, personal blog, and LinkedIn profile to my Content Runner profile. I think what really helped me was to list the topics where I had the most writing experience. Clients could easily scan my list and contact me when they saw that I had a background in the same area where they had a need. Like other writing websites, Content Runner has an open order system and a direct order system. When I returned to the site, I completed several articles available as open orders. I did the best job I could and it wasn’t long before I had several positive reviews on my profile. Within about six weeks, I started getting private inquiries from clients quite often. In the past six months, I have earned at least $15,000 from my top two clients alone. This brings me to an important point. Whether you are writing an article from the open orders area or responding to a client inquiry, always look at it as an opportunity to build a long-term relationship. Clients who like the work you do as an open order are likely to contact you directly about additional work. When you receive an inquiry, remember that professionalism and manners go a long way. Be sure to thank the client for contacting you, even if you don’t feel qualified for the job or aren’t interested in it. For work that you do want to take, keep in mind that it’s your job to sell yourself but it’s also important not to be too aggressive about it. After thanking the client, I typically outline my experience in the area he or she needs content written about and offer at least one writing sample. This highlights my unique style and experience at the same time. I then answer specific questions the client asked, which typically have to do with my rates and how to get started working with me. Although it’s technically not my job to tell them how to set up a direct order, I have found that providing this information towards the end of our email conversations leads to new work more often than not. I think anything you can do to show that you are responsive and willing to go the extra mile helps the client form a positive impression of you. If you answer an email inquiry and the client doesn’t respond, don’t take it personally. His or her company may have decided to wait on the project, which means you may get another email several months down the road. Even if another writer got the job over you, it just means that he or she was a better fit. That’s business for you. As I mentioned, a large percentage of my work on this site comes from just two clients. The more I provide them with excellent copy and respond to their needs, the more work they send my way. Because of Content Runner’s transparency policy, I submit my work through cloud-based systems such as QuickBase, Rackspace, and BaseCamp rather than the site itself. My clients and I have worked out an hourly rate and I send them an invoice each Friday that they pay through Content Runner as one large order. I have thoroughly enjoyed getting to know both of them and feeling as if I’m an integral part of the success of their business. These relationships have proven to be personally rewarding as well. I had flowers delivered to me at home from each of these clients when my mother passed away suddenly in early June. 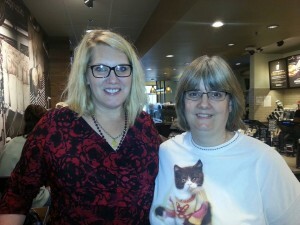 I also had the opportunity to meet a Content Runner client in person at a local Starbucks. It turns out that we only live about 45 minutes away from each other. With other sites, I didn’t know so much as the client’s last name or the name of their company. If you’re looking to build the same types of relationships, the best advice I have is to remember your manners and professionalism while always keeping an eye on the future. The photo is me on the right and my Content Runner client on the left when we met earlier this month. Lisa is leaving out a very critical piece of information here….and that is just how amazing she is to work with! Great article, Lisa–you are an expert at relationship building AND business building. So happy to have you as a key piece of my team!